Carrie Says: These were modified slightly from the original recipe. Preheat oven to 350°F. Spray an 8" square pan with olive oil. Set aside. Place the honey in a large glass measuring cup. Microwave on high power until the honey is runny & just bubbling, 45 to 60 seconds. Add cocoa & stir with a fork until well combined. Let cool to room temperature. Meanwhile, in a small bowl, place the flour, baking powder, baking soda, & salt. Whisk until well combined. In a large bowl, combine the applesauce, oil, egg, & vanilla. Whisk together until well blended. Add honey, cocoa mixture & whisk until smooth. Add the flour mixture to the liquid mixture & stir until no traces of flour remain. Scrape the batter into the prepared pan. Bake until the surface looks dry around the edges of the pan & a toothpick inserted in the center comes out with moist crumbs clinging to it, about 25 minutes. Do not overbake. Place the pan on a cooling rack & let cool completely before slicing into 16 squares. 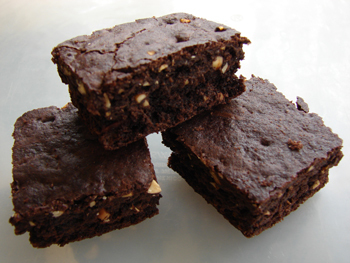 Store the brownies in an airtight container at room temperature for up to 3 days. This entry was posted in Confections, Dessert, Downlow and tagged applesauce, baking powder, baking soda, brownies, Cre8ive, eggs, honey, olive oil, salt, unsweetened cocoa powder, vanilla extract, whole wheat flour by Trish. Bookmark the permalink.